All Byron Park District aquatic activities are held in the Byron High School Swimming Pool which is open to the entire community! The Byron High School pool is the perfect pool for lap swimming, water walking, open swim and group usage. 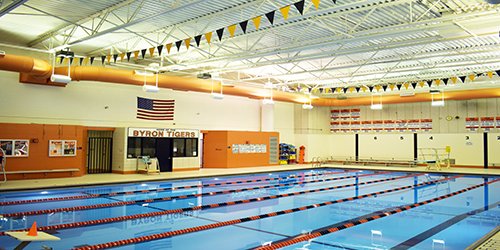 The Byron High School Swimming Pool is a six lane 25 yard indoor pool equipped with a one meter diving board. Pool depth ranges from 4 ft. to 12 ft. Patrons requiring assistance entering and exiting the pool may utilize the "Easy Ladder" or the park districts ADA compliant chair lift. Public locker rooms are available for use. Please note, children 5 years and older, must use the locker room of their gender. Byron Park District does not supply locks or towels, and locks should be used only during the time in which you are utilizing the facility. Swim noodles, diving rings, life jackets, and various balls are available for use during all open swims. All children under ten (10) years of age must be accompanied by a responsible adult, 18 years or older. Due to the Illinois Dept. of Public Health Code, all children who are not toilet trained must wear swim diapers. All swimming pool patrons will need to enter door #54 to check-in at the Park District Registration Office. You will then receive an admission pass that must be given to the lifeguard on duty at the pool. Once checked-in, pool patrons may park/walk down to the pool and enter via the aquatic entrance. Swim lesson or aquatic fitness participants can enter door #10 and check-in at the swimming pool. Pool patrons may exit the facility at the aquatic or BHS entrances. NOTE: Please be aware that our pool is a multi-use pool with several activities occurring at the same time. Lap swim times occur during other aquatic activities and one to two lanes are usually available for use.